For those of you that know me in real life you know that I love dinosaurs. I mean, I’m 28 and the t-shirt shown in this picture glows in the dark and my profile picture is of me reading Jurassic Park, that’s how much I love them. 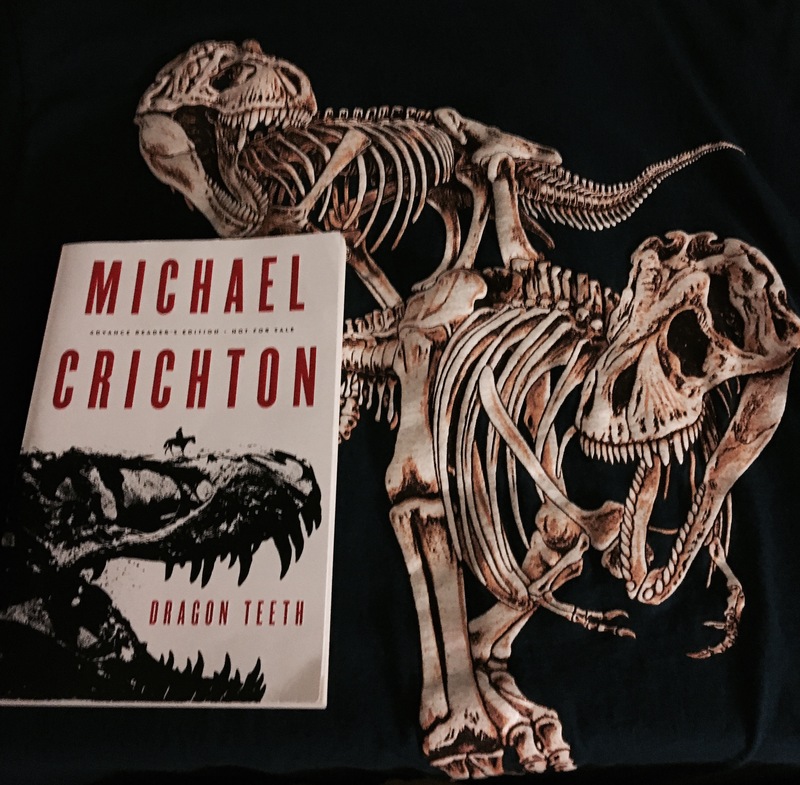 So naturally, when I found out the deceased Michael Crichton (author of Jurassic Park and The Lost World) was having a recently found manuscript published, I harassed the publishers at Harper until they kindly sent me a copy. And let me tell you, I was NOT disappointed. Dragon Teeth takes place in the late 1800s when the west was still wild. The story follows young William Johnson, a student at Yale, traveling to the west with a Yale paleontologist on a $1000 dare from his nemesis at school. The Yale paleontologist is named Othniel Marsh and is an extremely paranoid man who is convinced his own nemesis, Edward Cope, is following him west to steal his finds. When Marsh takes Johnson on the fossil expedition only to abandon him in Cheyenne, Wyoming, Johnson is forced to find a way to stay out west for the summer or he will not only lose the $1000 bet, but also his pride. When he runs into Edward Cope, he makes the decision to travel with Cope’s group to hunt fossils in the dangerous outlaw and Indian covered land. Johnson hopes he can make it out of this trip unscathed but will he even make it out alive? Dragon Teeth is 285 pages long and took me 5 days to read. I absolutely loved this book and am giving it a 4 out of 5. While it did take me longer to finish this book than I normally would, I just really didn’t want it to end! Crichton’s writing has a way about it that fully immerses you into the world he’s created. I will absolutely be reading this book again and highly recommend anyone who likes adventure, dinosaurs or just plain old great writing! Thanks again to Harper for sending me a copy of this book!